Just when you think you've seen every wall decal option out there, Blik Surface Graphics has gone and added some Threadless-created/inspired wall decals to their collection! This isn't the first time -- last year this design created by a Threadless artist was added to the Blik store. However, it now seems that adding more designs, more frequently to the Blik store will become a regular occurrence. Some of the current designs work better than others for a child's room or nursery. And since they're not intended solely for kids, that's okay. We're really loving Nerd Berd, Alphabet Zoo and Insomnia for a modern nursery. And like Threadless, the clothing shop, you'll be able to vote on which designs are produced next. Who would have thought buying a night light could be so complicated? After all, as long as the bulb keeps us from dropping the baby in the middle of the night, we're happy. We can only imagine that complicated is a good thing since it means that all of us night light shoppers have a lot of options. Here are some light we liked, some more traditional than others. Gummilights by Jellio are molded to look like Gummi Bears, "but at night, the tiny LED's in their butts turn them into the coolest lights you could ever own!" 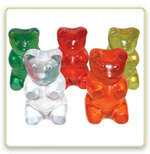 We love Gummi Bears and can see the coolness of these little guys. But for $125 a pop, we might just have to stick to the edible kind. If you really have to have a bear night light, we suggest My Pet Lamp -- TerriBear by Offi. It's available in six colors (Soft White, Mellow Yellow, Sky Blue, Sunset Orange, Hot Pink and Misty Green) and slightly more affordable at $59 from Design Public. For some reason, it comes with a washable marker that allows you to write on TerriBear. A slightly furrier take on the animal night light, Twilight Turtle makes us feel really good. "Twilight Turtle projects a complete starry night sky onto the walls and ceiling of any room. Choose from three soothing color options – blue, green, and white – to create magical, tranquil environments that are ideal for helping children of all ages ease into a restful sleep." We're not sure Twilight Turtle will help you navigate a nursery in the middle of the night, but we love it as an option for older children needing a bedtime friend. DonDon and Kam Kam Atmosphere lamps represent the more domestic type of animal in our lives -- dog and cat, to be exact. Coming in at $48 from Pokkadots, these lamps appear to provide more of the needed illumination a child's room requires, while still having personality. Finally, from Pottery Barn Kids (and surprisingly not an animal in lamp interpretation), this fairly simple, but pretty flower night light. It'll do the job, but probably won't make any friends. At $19, sometimes you just need a light to do the job. 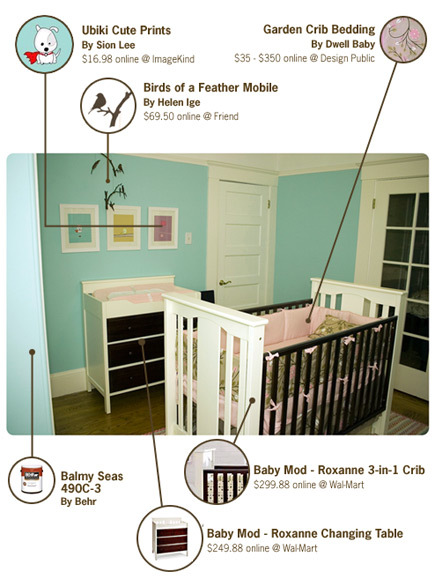 When we purchased the Birds of a Feather Mobile by Helen Ige, we were put-off by the $69 price for a few moments. After all, your purchase seems to be nothing more than a 11 by 13 piece of walnut veneer and some string. 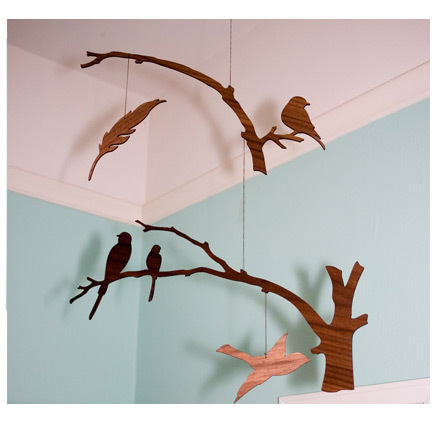 When we saw that the bird and tree pieces are meant to be punched out of a piece of wood that can become a stencil, we thought, "okay, we can make *something* else out of this" and swallowed the price. That *something* that ended up being made is this piece of nursery art that was intended to tie all our nursery colors together. Yesterday, when we posted the great fabrics from Repro Depot that we thought would inspire anyone to get sewing, we said that making a bib was "as basic as it gets." Seeing these awesome Mama Merit Badges over at The Junior Society the other day reminded us of another source for merit badge motivation. You Can Do It! 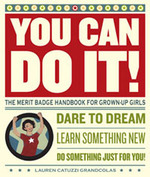 The Merit Badge Handbook for Grown-Up Girls is exactly the sort of book that will give you that kick start to get out and do the sort of things you've always wanted to do or learn, but never quite had the time to try to conquer. The book was begun by Lauren Catuzzi Grandcolas, who, sadly perished in Flight 93 on September 11. Her two sisters, however, recognized the power of this motivational guide and completed it in her honor. And each chapter, or rather, activity is certainly written to get you inspired. An activity is outlined, badge steps to get you started are given, you're introduced to a mentor in the field and then you're given examples of how to go "beyond the badge." Best of all, when you've completed the activity (Cooking, for example), there's a merit badge sticker to give yourself as a reward. We love this book because it breaks down the seemingly impossible and makes it quite doable. Highly recommended. There was a time that parents (well, mothers) weren't just encouraged to sew clothing and projects for their children, but were expected. Now, this isn't quite the norm nowadays but mothers and fathers are getting back in the habit of being crafty for their and their kid's sakes. For those who are starting to get the itch to stitch, we wanted to create a project that could be done without patterns and in as short amount of time as possible. If you're like us, you're probably pretty tired of the options for most printed t-shirts and onesies for baby. Yeah, we know your little girl is "spoiled" or "daddy's little princess," we just don't want to read it about it. We're actually quite amazed by how not cute some of them are becoming. Case in point: "Someday I'll Get Trashed at Prom" shouldn't be an inspirational statement. Enough of the lecture and on to the solution. Where do you go when you want apparel for your little one that has the same sort of personality as your ironic shirt-wearing self? Well, we're just loving the offerings from Threadless, the online site/service that allows its customers to design and vote on the most appealing designs created. As evident in our closets, we've been fans of Threadless for adults for years and are delighted to see the relatively recent influx of shirts and onesies for kids and babies. Deny yourself something for nine months and watch how much more desirable it becomes. Now, deny yourself something and then try to not go crazy as you see it on baby item after baby item. While we're waiting to see the new trend of mimosa onesies take off, we'll have to settle with the insane amount of sushi baby and children items appearing everywhere. Now don't get me wrong, we love sushi and love the alternative to the usual pink or blue baby animal everything. It's just a little too much when you're craving a hunk of fatty toro. But if we're to get our fill, we might as well do it right. Sam and Bellie recognize the sushi baby stuff demand so well that they offer their baby cloth bib set with matching burp cloth ($25) in two patterns: Sushi and Sashimi. And since every mother-to-be is warned that you can never have too many burp cloths, you can also pick up this two cloth burp set ($15) over at Hip & Little in the same "Sashimi" fabric. The nice thing about Hip & Little's set is that they offer a simple chopstick pattern that we haven't seen elsewhere. Considering that your baby won't be doing too much walking in her early months, it's kind of funny to spend so much money on shoes she'll be soon outgrowing. However, we couldn't resist these inexpensive, yet adorable shoes from Pearl River. At $5.50 - $6.50 a pair, let those little feet grow! When it came to decorating our nursery, we wanted a room that felt modern but also incredibly feminine. And without having a particular theme, we wanted the whole look to feel cohesive. So it was all about coordinating colors and modern styles (while still keeping it all affordable). Where to buy all of this online? We especially love the find of the Birds of a Feather Mobile by Helen Ige, which is subtle and delicate and certainly not too childish at all.